220 in stock Need More ? 20 cm 216 p. : ill. Originally published: New York: Amulet, 2008. In the second book of Jeff Kinney's bestselling series, team up with Greg Heffley once again, this time to try and take on his big brother. As you can guess, it doesn't work out too well... Rodrick actually got a hold of my LAST journal a few weeks back, and it was a disaster. But don't even get me started on THAT story. Whatever you do, don't ask Greg about his summer vacation because he definitely doesn't want to talk about it!It's a brand-new year, with a brand-new journal and Greg is keen to put the humiliating (and secret!) events of last summer firmly behind him. But someone knows everything - someone whose job it is to most definitely not keep anything embarrassing of Greg's private - his big brother, Rodrick. 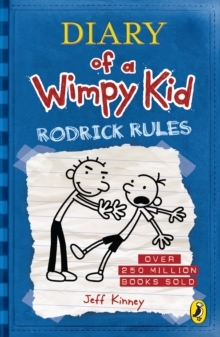 How can Greg make it through this new school year with his not-quite-cool reputation intact?Even reluctant readers of 7+ will love diving into Greg's world, and reading about his exploits in his diary (sorry, journal! ).